Coverage: Practice sessions and race on BBC Radio 5 live sports extra; qualifying on BBC Radio 5 live. Live text commentary, leaderboard and imagery on BBC Sport website and app. Lewis Hamilton says he is leading the championship despite "punching below my weight" so far this season. 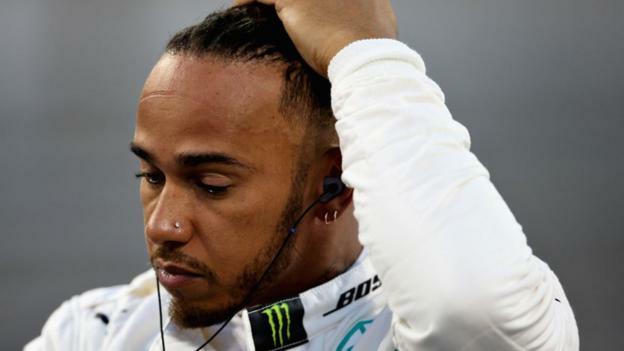 The reigning champion has struggled in three of the four races but took the lead after a win in the last race in Baku after his rivals hit trouble. Hamilton said if he "could get on top of the issues" Mercedes have with the car and "start to be more consistent", he would be happier. "Then I know I can punch at my weight or a little above it," he added. "At the moment I am punching below it and that is not sufficient to win the championship. "We are capitalising on a lot of the surrounding circumstances that hinder the outcome of a race, for example the last one. I will take it for now but for the long term [we need to improve]." Hamilton inherited the lead in Baku when team-mate Valtteri Bottas suffered a puncture with four laps to go. The Briton also benefited from Ferrari's Sebastian Vettel making a mistake when trying to overtake Bottas for the lead a lap earlier. The German damaged a front tyre and dropped down to finish in fourth place. Hamilton said the Ferrari had been the fastest car so far this season and that he was still struggling to get the Mercedes to work at its optimum with the new tyres Pirelli has introduced this year. "I am just hoping to be able to work more with the car," he said. "I am waiting for myself and the car to fully sync up. "We are talking mini percentages. The tracks so far seem to have worked well for Ferrari and I anticipate they will be very strong here again this weekend. Up until now their car has performed the best but maybe it is about unlocking the potential of our car." Vettel, who is four points behind Hamilton going into this weekend's Spanish Grand Prix, gave away a chunk of points to Hamilton with his error in Baku but said it was "pointless" to talk about the championship so early in the season. "We have so many races to go," he said. "At the moment it is the fight to maximise every race result." Bottas, who beat Hamilton in two of the four races and was on course to do so again in Baku and take the championship lead before his puncture, said he was optimistic he could recover the lost ground. "I feel very neutral," the Finn said. "I am only looking ahead. It is nearly the while season ahead and at some point you are going to run out of bad luck." Red Bull drivers Daniel Ricciardo and Max Verstappen say they will compete with "more margin" but are still allowed to race each other following the crash that took both out of the race in Azerbaijan. The crash followed 38 laps of intense fighting, and Ricciardo said he believed the team would handle it differently if the two found themselves in the same situation again. "I see it clearer," the Australian said. "A lot of things could have been handled differently from all aspects but I am comfortable within myself. I have moved on. "In the future if we find ourselves in a similar situation, I think it would be handled differently. The team would either get us to swap [position] or do something. "When you are racing team-mates that hard, I guess it gets to a point over the limit. I guess that's where they'd step in if we hadn't controlled the situation ourselves. We still want to race but we have just got to race clean." Verstappen said: "We apologised and Daniel and I are good together. We have a lot of respect for each other. We just try again. I guess we take a little more margin. "It is not nice to see your team boss angry but it was for a good reason - or a bad reason, depending on you look at it. We understood it was not right, so it was quite an easy conversation in that way. There was not really a discussion. We all know it was bad." Verstappen has been criticised after incidents in all four races have compromised his championship chances - he lies eighth, 52 points behind Hamilton. He said: "I know what to do. It is just not coming out at the moment. I keep doing the same thing because it has worked in the past and it will work for me in the future. "I am not frustrated. I am not happy with how it has been going but luckily I am not slow. If I was slow I would be worried, but I'm not."